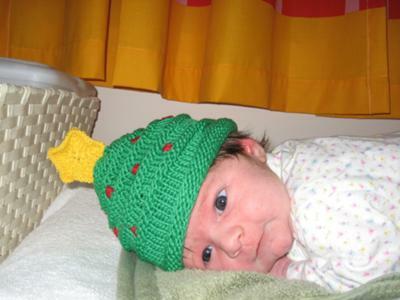 This Christmas Tree Baby Hat was knit by me in the last few weeks of my pregnancy. My daughter, born 11/30, was to meet most of the extended family on Christmas, so an appropriate hat was needed! The green is Debbie Bliss Merino DK, the yellow is Plymouth Dreambaby DK. I used double pointed needles - US5 for the hat and US3 for the star. The original pattern is a set of hat and booties. I wasn't very good at making pompoms, so I added a knitted star to the top of the tree. This hat is an easy knit with high-impact! I think it took only a few days. This hat was fun to make and my dog was a good sport about modeling it as well! My daughter is going to be 3 in a few weeks -it's probably time for a new Christmas Tree Hat for her! 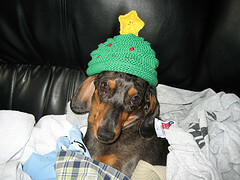 Everyone needs a Chrstmas Hat! Forget the Christmas sweaters.....what you REALLY need is a Christmas Hat! This looks great! I just had to vote on your hat, Becca. It is so cute! Looks great on Jackson, too. Aw that little baby is so sweet and the DOG! So funny. Love the star on the hat, better than a pom I think. Return to Hand Knit Baby Hat Photos.